Visitacion Valley Family Center has a new Community Nutrition Program provider, Project Open Hand (POH). This organization has been serving the community at the John King Senior Residences and now will serve lunches to seniors and adults with disabilities 7 days a week, year round. In 2016, the City entrusted APA to create this family center at 66 Raymond Avenue and APA facilitated efforts to set up an intergenerational program with nonprofit partners. ​Another one of the non-profit partners at this family center is Asian Pacific American Community Center (APACC). Its mission is to help strengthen Asian Pacific American families living in Visitacion Valley by providing linguistically and culturally appropriate programs and services. Felton Institute is another non-profit partner at 66 Raymond Avenue. It provides community services to address the needs of the diverse aging population and adults with disabilities in Visitacion Valley, and subcontracts with APACC to provide the culturally and linguistically appropriate social services such as intergenerational activities that bring together youth, older adults, and people with disabilities. These partners organize workshops and provide daily activities for the seniors at the center. Every Friday year round, volunteers help operate a community food pantry inside the community center's auditorium. This is one of the largest food pantries in the city, serving 500 households, including grocery delivery for the housebound. 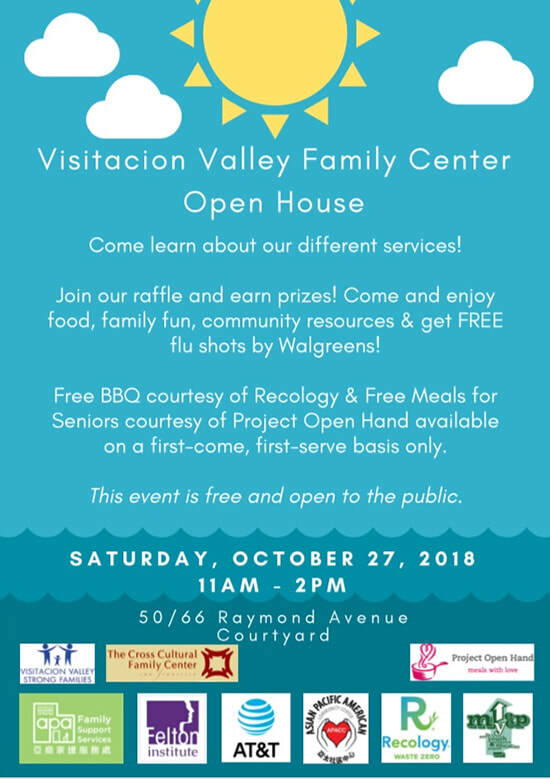 Visitacion Valley Family Center is having an open house on Saturday, October 27 from 11 am - 2 pm. Please see event flyer below.